There was just one single show on in the UK last night (August 11) as the season very apparently draws to an end. British Warriors Boxing hosted a six-fight card at the Llandarcy Academy of Sport in Neath, Wales, with Commonwealth flyweight champion Jay Harris (13-0) returning to the ring for the first time this year. Explosive flyweight, Harris, won all six rounds against Nicaraguan Cristian Narvaez (15-9-4) to dust off the ring rust following a nine-month absence from the squared circle. It was a very short appearance last November for Harris against no.1 Hungarian super-flyweight Gyula Dodu (13-7-1) at the luxury Hilton Hotel in Mayfair, the Swansea man making short work of the Central European by dropping him twice in the opener and again in the second – all left hooks to the body – to win the fight by KO, just 29 seconds into the second round. In his 13th professional contest, the strong ‘Swansea Jack’ started brightly against the Central American standing toe-to-toe in the opener, outworking his tough, durable counterpart, who has only been knocked out once in 29 contests. Narvaez switched stances in the second segment to try to thwart the home fighter’s momentum but to no avail. The Nicaraguan looked frustrated by the third and fourth rounds and began to telegraph his attacks, which Harris took full advantage of. In the fifth and penultimate round, Narvaez was visibly feeling the power of the Welsh atom after a series of one-two combinations landed flush, dislodging his gumshield at one point. It was in the sixth and final round when Harris managed to wind the obstinate opponent with his signature body shots, which have downed and finished off so many other victims, but the experienced 23-year-old managed to use his skills to survive to the final bell. Harris won the six-round contest 60-55 on points against the man from Ciudad Sandino, who is the current WBA Fedecentro flyweight champion. Harris is the current Commonwealth flyweight champion with 56 rounds under his belt, 13 wins, seven knockouts, ranked 2nd in Britain behind fellow countryman and British champion Andrew Selby (10-0). In February 2017, then 26, with just 30 professional rounds on his slate, the body snatcher confronted Cameroon champion Thomas Essomba (7-2) at the iconic York Hall, defeating the Sunderland resident comfortably via unanimous decision over 12 rounds to lift his first major title. Heavy-handed Harris will defend his Commonwealth title for the first time on October 12 in Somerset, just a short drive across The Severn Bridge for his army of fans. Also on the card, welterweight Kieran Gething (6-1-1) stopped Catalan Jorge Moreno (9-9-1) in four to notch up his sixth straight win. The 24-year-old Welshman, who is managed by 2002 Commonwealth Games gold medallist Jamie Arthur, was floored in the first but came back to deck the Nicaraguan, who resides in Barcelona, in the second, eventually halting him in the fourth with unrelenting head shots, which forced referee Martin Williams to jump in and save the Central American. Gething, who was due to face Basi Razaq (7-1-1) in a British Challenge title fight, only for the North Easterner to pull out with a hand injury, will next be in action in his hometown on 28 September, hoping for a shot at the Welsh Area welterweight title. Lightweight Lance Cooksey (6-0) also had a scare when he found himself on the canvas for the first time in his career in the second segment. The Rhoose resident had never even conceded a single round in his previous five fights but still managed to win 58-55 on points in a stern test against the confident Zimbabwean Taka Bembere (1-3), who had entered the fight enthused off the back of a surprise stoppage win over unbeaten prospect Matthew Fitzsimmons (3-0) in Liverpool last month. Middleweight Jake Anthony, 19 from Ammanford, moved up to 3-0 with a shutout points win over four rounds against ‘The Bruiser’ Bryn Wain (0-19). David White Jnr (1-1). 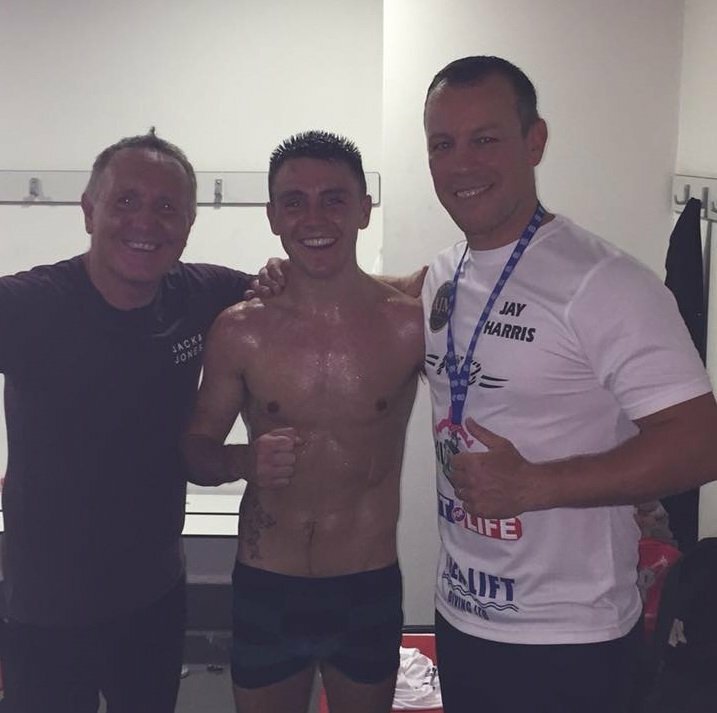 Cardiff’s featherweight was at the wrong end of an enthralling 38-36 decision win against the 21-year-old trained by former Central Area lightweight champion Kieran Farrell, who has been closing in on a win ever since giving 9-1 prospect Chris Matthews a close fight last May.